Are you using any online money management tool, such as Mint.com or Yoodle? If you are, then there’s one more choice for you: Quicken Online is FREE for everybody starting October 13, 2008. Before the product is free to try, but it will cost you $2.99 a month if you decide to use it. I have been using Quicken for years to track my finance, including credit card and bank transactions and investments, but so far I have stayed away from online tools (I do use Fidelity’s Full View, which is provided by Yoodle, to see check my brokerage accounts) because I don’t really feel the need of having one: the chance for me to check my finance when I am away from home (like this trip to China) is rare and when I am at home I can always use the software installed on my computer. However, since the tool just became free, I think maybe it’s time to give it a try. 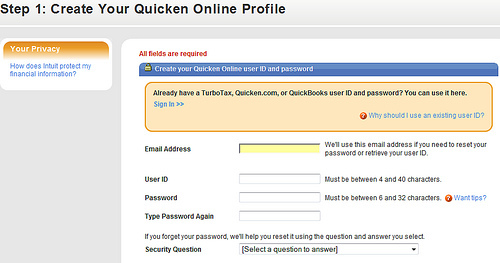 Setting up an Quicken Online account is quite easy. The first step is creating an online profile by providing email address, user ID and password, etc. Once an account is created, the next step is to link existing bank accounts, credit cards, or brokerage accounts to Quicken Online, just like what you need to do with any other online money management tool. 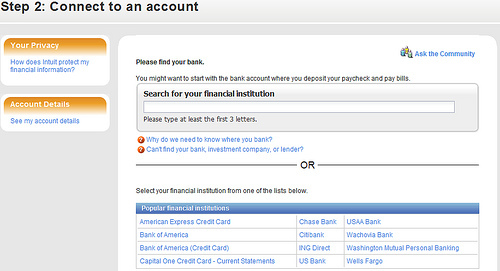 Too link an account, you can either search the institution by name, or choose one from the list of financial institutions that Quicken provides. To make things easier for you, Quicken also has section with most used institutions such as Bank of America (my bank), ING Direct, Chase, and Citibank. Once you find the institution you want to connect to through Quicken Online, you will need to provide the necessary credentials (those you used to access that account) in order to link the account at that institution. For instance, to link to my ING Direct account, I will need to provide my Customer Number and PIN. The process of linking to an external account needs to be done just once. After an account is connected, all information you need to know about that account is downloaded automatically from Quicken Online in the future. Once the external account is imported to Quicken Online, I can see all the activities of the account, as well as activities (including Money In and Money Out and a Summary) for all the bank accounts, credit cards, and brokerage accounts that are linked to Quicken Online. Since I only linked one account, what shows in the following is quite simple. 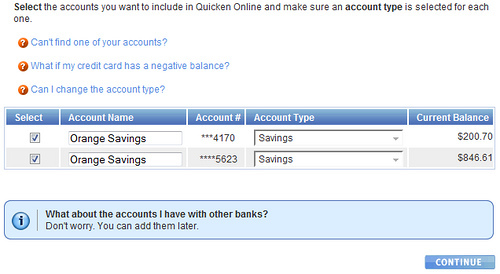 As you can see, setting up a free Quicken Online account is very straightforward. If you don’t have a stand alone version of the software (I use Quicken Deluxe, you can purchase it at 25% off with free shipping), then the free online tool is an option to help you track where you money goes, which is important in getting your finance in order. Interested? Try the free Quicken Online to see if you like it. For other Quicken products, use these Quicken Promotion Codes to save one the products and shipping costs. 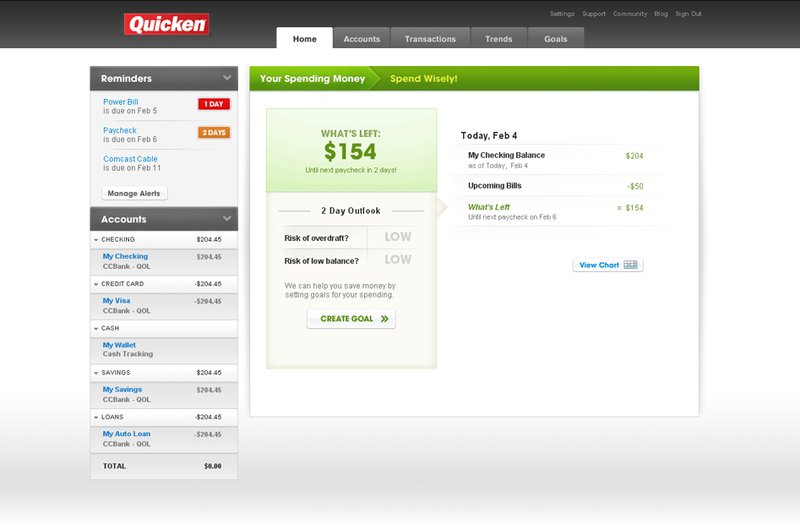 Quicken is the most helpful money management software to handle the finances. Today (April 3, 2009) manageME is about to launch its enhanced version http://www.manageme7.com at 2000 Hrs IST. The users can avail for free as well as paid ‘Plutus’ packages. You are all welcome to visit manageME7 for convenient money management. Three weeks into Quicken Online – and I’m dumping it. It is a nice thought, but riddled with issues. The worst of which is the inability to consistently get data synced with your financial institution. You may successfully get Quicken Online to link with your accounts, but then either never get transaction data or a generic “unknown” error. Their outsourced Tech Support for the product is essentially non-existent as you will get nothing more than generalized form letters back and never any resolution. Quicken recently isolated their community forum for the online product from their paid products, and based on the number of complaints and issues in the Online forum, one can take a stabbing guess as to why. Sometimes, things are free for a reason. Try out Perfios(www.perfios.com) – The best place to integrate all your Personal Finance with the maximum security.